Butakov Tramples His Way Past the Opposition! Sixteen of the finest Magic Online players in the world earned the right to compete at the 2012 Magic Online Championship for their share of $116,000 in cash prizes in the Gatecrash Sealed Deck, Cube Draft, and Standard Constructed formats. Going into the second day of play, Dmitriy "Butakov" Butakov was in sole possession of first place - but Andreas "Eken." Eklund, Malte "Malteko" Holm, and Hiroki "ht991122" Yamashita were all hot on his heels. When Dmitriy lost his first three Standard matches with his Junk Reanimator deck, it looked like he was going to lose his spot at the top as well. But a win against Christopher "Cozmo" Hartman in the 11th round was just enough for Dmitriy to secure his place in the finals where he would face Malte Holm. 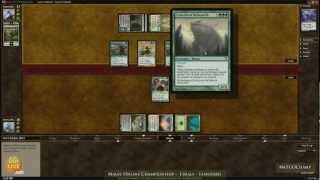 Piloting the format defining Black White Green "Junk" Reanimator deck, Dmitriy "Butakov" Butakov and his Craterhoof Behemoths were able to trample over Malte "Malteko" Holm in the matter of minutes to become the 2012 Magic Online Champion! Congratulations to Dmitriy Butakov who earned $25,000, an invitation to the 2013 Magic World Championship, as well as the right to defend his title next year at the 2013 Magic Online Championship. Think you have the skills to make it to the 2013 Magic Online Championship? 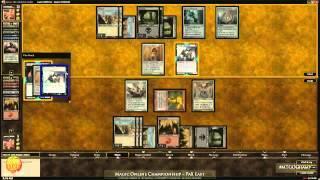 The 2013 Magic Online Championship Series is under way now. Visit this page for more information and a full schedule of season championships. Magic Online Championship Finals: "Butakov" vs. "Malteko"